There may be no such thing as an elk factory, but that's the term a regional wildlife manager with the Montana Department of Fish, Wildlife & Parks used to describe the Little Belt Mountains in the central portion of the state. His comparison of the Little Belts to an elk factory had a dual reference. The first was to the range's superb elk habitat that supports robust reproduction and is capable of supporting high numbers of the animal. 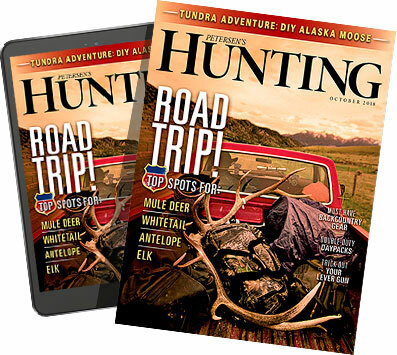 The second was connected to the fact that hunters enjoy easy access to public lands in the mountains via the Lewis and Clark National Forest, making it one of the region's most productive areas for elk harvest. The Little Belt Mountains (located northeast of White Sulphur Springs) are an attractive destination for nonresident "do-it-yourself" elk hunters for several reasons. First, the range offers numerous access routes along Forest Service roads but retains enough roadless territory to give elk needed security from human activity. Reaching the best elk hunting generally requires hunters to penetrate habitat at least a mile (two is better) from vehicle routes. To reach such habitat, hunters can hike cross-country or travel on one of the many maintained trails in this popular mountain range. Another desirable feature of the Little Belts involves elevation. Eight thousand feet above sea level is the height often described as that at which outdoor recreationists become routinely susceptible to altitudinal-related stress and potential illness. Hunters unaccustomed to exerting themselves at high elevations often have a tough time navigating rugged elk terrain in lofty habitat. However, the Little Belts boast copious tracts of excellent elk habitat between 5,500 and 7,500 feet, making the mountains more altitude-friendly for adventurers coming from lower elevations. Hunters also have numerous lodging options for a Little Belt elk hunt. Camping is available in the Lewis and Clark National Forest. Several small towns in the area (White Sulphur Springs, Monarch, Neihart) provide a base camp of motels and restaurants and are close enough to the mountains for daily "drive to" hunting. Central Montana is also home to another of the state's iconic elk hunting destinations, the Rocky Mountain Front. The Front refers to the region where plains and foothills abruptly end at the veritable wall of the Rocky Mountains. A classic Western elk hunting experience involves a "pack-in" hunt where an outfitter brings hunters (and supplies) into a wilderness camp via horseback. The Bob Marshall and Scapegoat wildernesses, frequently accessed from the ranching communities of Augusta and Choteau, are two superb destinations for such a hunt along the Rocky Mountain Front. The area can also be accessed by intrepid hunters for single-day or multi-day elk hunting without the services of an outfitter. Several guiding operations in the area also offer lodge-based hunting on private and/or public land for those seeking more creature comforts. Timing a self-guided elk hunt along the Rocky Mountain Front inevitably involves some trade-offs. Those who take to the mountains in the early weeks of the state's generous elk season, which opens the fourth weekend in October and closes the Sunday after Thanksgiving, typically enjoy milder temperatures and more pleasant hunting conditions. However, under such circumstances elk tend to use more remote, high-elevation habitat and dark timber, making them a bit tougher to find and farther away from roads and trails. Hunting toward the end of the season frequently involves dealing with snow and cold, but such conditions also move elk onto lower winter range and make them more accessible to hunters. Along with elk, the central portion of the Treasure State is an excellent destination for both mule and white-tailed deer hunting. Intrepid individuals seeking a trophy mule deer buck need look no further than the Rocky Mountain Front. The physical challenge of this area for an unguided hunt is considerable, especially during the prime weeks of late November, which coincide with the mule deer mating season, but the payoff can be extremely rewarding. Snow may make foot (and vehicle) travel more difficult, but it also makes mule deer herds more visible. During the mating season, the best way to find a large-antlered buck is to focus on herds of females. In a state more than 600 miles wide, Central Montana encompasses a vast chunk of real estate. Mule deer hunting is as attractive on the region's east side as on the Rocky Mountain Front. The Upper Missouri River Breaks National Monument sprawls across more than 378,000 acres of public land along its namesake river. Located north of Lewistown, the eroded sandstone bluffs and deep coulees along the river in the monument and adjacent areas are prickled with junipers and ponderosa pines. The region has been known as productive mule deer habitat since the days of the Lewis and Clark Expedition and is a favorite destination for many resident hunters. Due to its remote character and challenging terrain, a small percentage of the mule deer harvest each year consists of some outstanding bucks. Outfitted mule deer hunting is available in the Upper Missouri Breaks region on both private and public lands. Unguided hunting is a perfectly feasible option but requires preparation and planning for the best success. Vehicle travel on the rough trails in the area becomes nearly impossible with rain or wet snow. Overland hiking involves scaling and descending steep terrain, which requires good physical conditioning. Fuel, groceries and other supplies are limited in the tiny towns on the outskirts of the Breaks. However, mule deer hunters who keep an eye on the weather and follow the Boy Scout motto of "be prepared" will have an unforgettable experience. The Upper Missouri Breaks National Monument and adjacent areas are also home to elk and bighorn sheep. Some of the most outstanding trophies of both species are taken each year in the Breaks. Tags for both species are issued in a drawing and are difficult to obtain. However, applicants can opt to receive a bonus point for each year they apply unsuccessfully, upping the odds of securing a tag through persistence. White-tailed deer are widely distributed across Central Montana. Exceptional bucks can crop up almost anywhere. In many areas, mule and white-tailed deer are found in the same habitat, giving the deer hunter a choice as to which species becomes the chosen target. As a rule, the best whitetail hunting occurs along riparian areas, including major rivers and smaller creeks. Much of the land in such locations is privately owned, but careful map analysis may reveal public land on, or adjacent to, such watercourses. Additionally, the state's block management program allows public access to private land and is a valuable resource for both mule and white-tailed deer hunters. The Milk River flows from Canada on a southeasterly course to Havre, where it then continues eastward. This riparian corridor has a deserved reputation as one of the best whitetail destinations in the state. Astute hunters also target creek tributaries that feed the Milk River when searching for whitetails. Antelope (pronghorn) were hunted in Central Montana by members of the Lewis and Clark Expedition more than 200 years ago. These iconic creatures of the plains are found in many areas and are fascinating quarry. Hunting opportunities occur over most of Central Montana with varying numbers of available licenses (all antelope tags are issued in a drawing). Good antelope hunting is found north of Highway 2 from Shelby to the Milk River. Antelope hunting with simple access to public land is found southwest of Havre. Seasoned big-game hunters understand that one of the keys to consistent success is familiarity with a hunting area. A supremely attractive way to become acquainted with Central Montana is to embark on an upland bird hunt in the weeks or days prior to the big-game season. The region is also an ideal destination for stand-alone bird hunting. The Lewistown area is a perennial favorite for pheasant hunters, along with the Milk River corridor farther north. Hungarian partridges are abundant on the croplands and prairie pastures east of Interstate 15 from Great Falls to the Canadian border. Native sharp-tailed grouse are scattered across the region, sometimes found in the same agricultural habitat as Hungarian partridges, but also at home on the virgin prairie. Ranchlands, flaxen wheat fields, soaring mountains and winsome prairie provide Central Montana an alluring diversity of terrain. From upland birds to big game, the region nurtures a fascinating array of wildlife and offer hunters a multitude of classic Western sporting experiences. All nonresident big-game hunting licenses in Montana are issued in a drawing. Application deadlines vary with species as indicated below. Upland bird licenses may be purchased online or from local license agents. For applications and more information for planning a hunt, visit www.fwp.mt.gov.